Have you been searching for a glazed Regency style fire door? Introducing the FD30 Fire Door Oak Richmond 2-light Glazed with Raised Mouldings. A rare traditional Glazed Regency door which is also certified as an FD30 Fire Door. This is a classically-styled, internal door typical of the Victorian and Georgian eras. It is a glazed internal door for most living areas of the home such as kitchen, dining room, living room and snug areas. For added light transfer between rooms the Oak Richmond FD30 has two clear flat glazed panels above two lower smaller rectangular panels. This particular version has also, the added feature of raised mouldings around all of the panels, this on both sides of the door. Certified for fire safety of 30 minutes for areas requiring a greater level of protection. Furthermore this deluxe fire door is up to modern Building Regulations Standards for all interiors. Your new door comes with a manufacturer’s 10-year warranty. This oak fire door is also available as a standard all timber 35mm fire door, and a standard glazed version which has clear bevelled glass. A Glazed Regency Style Fire Door for all locations; dining room, living room, kitchen. Traditionally, bathrooms were also be fitted with these beautiful doors, with the addition of curtains. Again, the classic, flourished design offers a rich style to both period and contemporary designer interiors. With a distinctive Regency look. So the panels are raised and the edge down to each panel has deluxe raised mouldings. Engineered doors are very stable and are designed to limit warping, splitting and small changes in size with the seasons. Un-finished it comes in preparation for your own choice of topcoats. An unfinished, engineered door which is ready for your choice of final decoration . It has an engineered, hardwood, solid core (weight up to 38kg). Also with two layers of 10 mm lippings all round. This model is also available as a standard (35mm) door. You can make adjustments on all sides up to 3mm on Fire Doors. So making it a perfect fit for new and existing door frames. You should not remove more than 3mm as this invalidates the fire safety certification on the door. 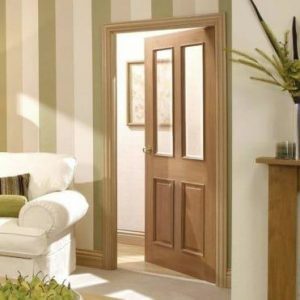 We can supply hinges, door handles, frames and intumescent strips separately for the installation of your FD30 Fire Door Oak Richmond 2-light Glazed with Raised Mouldings. We recommend a minimum of four hinges for this door. Seek specialist advice on which areas require fire doors. Also, your architect or local building control officer will offer advice. If you were wondering where to find A Glazed Regency Style Fire Door? Your search is over! Part of a new range of Fire Doors! This is just one of over 100 new fire door designs at onlinedoorstore.co.uk. Classic and contemporary designs to choose from with standard and glazed counterparts. Special price promotions on all year round!